Autodesk University 2017 Celebrates the Future of Making Things | Autodesk, Inc.
LAS VEGAS, Nov. 13, 2017 /PRNewswire/ -- Autodesk University -- At its annual flagship user event starting today, Autodesk, Inc. (Nasdaq: ADSK) welcomed thousands of architects, designers, engineers and digital artists from around the world to experience the future of making things. 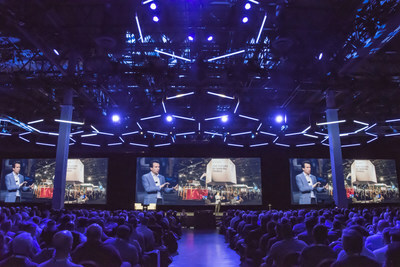 Now in its 25th year overall and its third carbon-neutral year, Autodesk University (AU) brings together nearly 10,000 people to learn, network and explore new ways to make buildings, infrastructure, products and entertainment as these industries increasingly converge. In his first keynote as Autodesk CEO, Andrew Anagnost will share an optimistic industry outlook on work in the age of automation, and how Autodesk will help customers do more, better, with less negative impact on the world. "The new wave of automation will undoubtedly cause disruptions, but technologies like artificial intelligence and robotics will be far more effective at creating job opportunities and spurring economic growth than many skeptics would have you believe," said Anagnost. In Wednesday's keynote, Senior Vice President Amy Bunszel will discuss how customers can use Autodesk's core products today to take practical steps toward the future of making things, and how the company is supporting that journey. On Thursday, Autodesk executives will provide a glimpse into the future of Architecture, Engineering and Construction (AEC) and Manufacturing. The keynotes will feature special customer guests including Kalitta Motorsports, Skanska and Van Wijnen, all of which are using Autodesk technologies to innovate, rethink the old way of doing things and make their businesses more competitive. Throughout the event, Autodesk University attendees will see how their peers are using transformative technologies like generative design, augmented and virtual reality, robotics, additive manufacturing and more. New to the event this year will be the AU Theater featuring eight sets of TED-style talks from industry innovators on topics ranging from Machine Intelligence to Factories of the Future to Climate Change Solutions. In addition to the keynotes, hundreds of hands-on classes and networking with peers, the conference offers numerous interactive exhibits that bring to life the future of making things. Examples include additively manufactured maritime vessels and parts; construction drones outfitted for high-resolution reality capture; generatively designed aircraft parts and airports themselves; factory floors and office furniture conceived using virtual and augmented reality; and a functioning Hyperloop pod. The AU exhibit hall layout was generatively designed this year using Project Discover from Autodesk Research to optimize the attendee experience. The software was also recently used for the interior layout of Autodesk'snew office in Toronto'sMaRS Discovery District. AU's carbon footprint is being offset this year through a collaboration with BioLite, maker of the ultra-clean wood-burning HomeStove that co-generates electricity from the heat of the flame. Thanks to clever design using Autodesk simulation software, each HomeStove reduces emissions by 90 percent and fuel consumption by half. Autodesk's purchase of BioLite carbon credits enabled the manufacture and sale of 10,957 HomeStoves in Uganda and India, further contributing to the 113,000 tons of CO2 Biolite has offset to date. This year's flagship Autodesk University event in Las Vegas is supported by Diamond sponsors Dell and HP. Autodesk University (AU) is a series of conferences and an online learning destination focused on inspiring, challenging and energizing Autodesk software users, partners, and industry leaders about the future of design and engineering. The AU conferences bring together more than 25,000 participants at live events in 14 countries through classes, forums and keynotes with industry experts and thought leaders. More than 2.5 million more engage through AU online, which offers free year-round access to learning content, professional development, and inspirational industry talks from the AU conference events. More information is available at the Autodesk University website, or by following @AutodeskU, #AU2017. Autodesk, Fusion 360, BIM 360 and the Autodesk logo are registered trademarks or trademarks of Autodesk, Inc., and/or its subsidiaries and/or affiliates in the USA and/or other countries. All other brand names, product names or trademarks belong to their respective holders. Autodesk reserves the right to alter product and services offerings, and specifications and pricing at any time without notice, and is not responsible for typographical or graphical errors that may appear in this document.